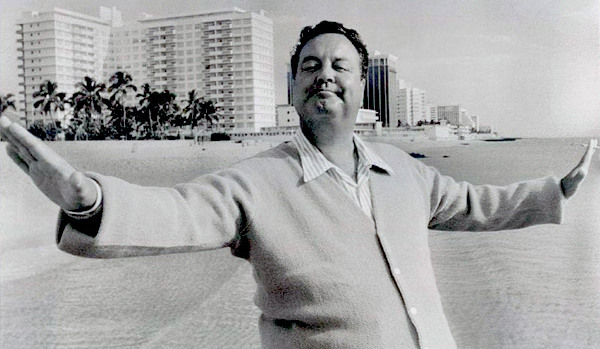 Comedian Jackie Gleason brought Hollywood to South Florida in 1964. Famous for his role as Ralph Kramden in the Honeymooners, Gleason was also an orchestra leader and infused his variety shows with huge musical numbers highlighted by the 16-member June Taylor Dancers. After loading his show on a train and moving to South Florida with great fanfare, he broadcast throughout the mid- to late-1960s from the Miami Beach Auditorium, renamed for him and now called The Fillmore Miami Beach at the Jackie Gleason Theater. Gleason's big break in TV occurred in 1949, when he landed the title role on The Life of Riley. He was hired to host a variety show, Cavalcade of Stars, in 1950, and was such a hit that he was given his own show on CBS in 1952. That's where he developed one of his catch phrases, "And awaaay we go!" His sketch characters included Rudy the Repairman, Fenwick Babbitt, Joe the Bartender and Rum Dum. His Honeymooners character, Ralph Kramden, was developed on his variety show, and the sketch was spun off into a stand-alone series for just one year, 1955. 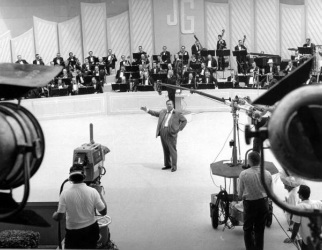 The Miami Beach-based Jackie Gleason Show ran from 1964 to 1970, when changing times and tastes eroded its popularity. But he aired several variety specials from the city on CBS and ABC in the 1970s. Gleason also starred in numerous movies, with the best-known being The Smokey and the Bandit series. 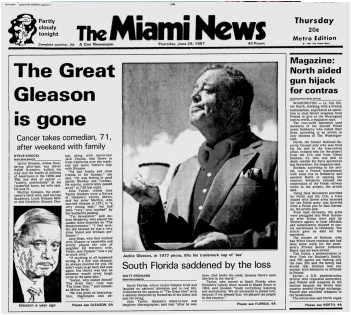 Throughout his time in South Florida, Gleason was frequently photographed on the golf course with famous show business and political personalities, including his friend, President Richard Nixon, who had a home in Key Biscayne, and Nixon's successor, Gerald Ford. After Gleason died of cancer at his country club home in Lauderhill, publicist Hank Meyer said, "He made history for Miami Beach and the state of Florida. It put Miami Beach on the map."